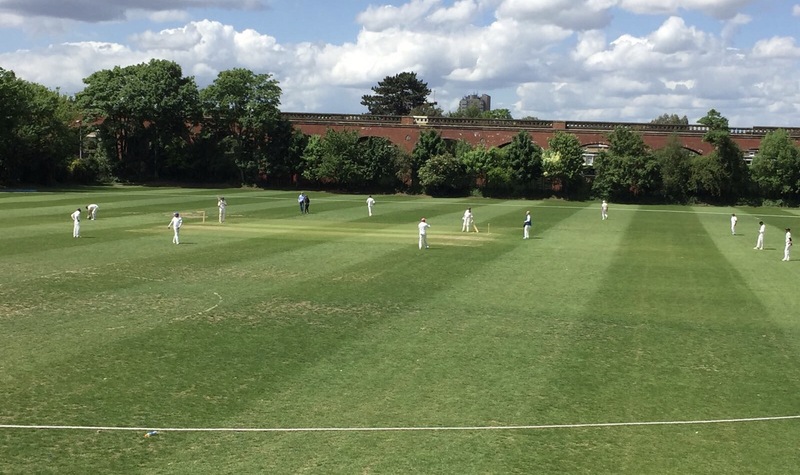 This week was a visit to Herne Hill in Borsetshire, to the delightful Edward Alleyn Ground and our opponents were the Ad Hocs. Cato Harris(on Burns) won the toss and they batted first, or perhaps the term guarded wicket is more appropriate as the actual run rate initially was dire. Sarson was first to face Newton who was on fine form and a Maiden was the first over. Asad took on Gray with accuracy and gave away 3 leaving him on strike. Newton unusually had a wide before a single passed it back to Sarson who did not complete the Over as Newton powered through the wicket. 5-1 after 3. Sarah Berman who is most frequently scorer was now in and meanwhile I had excellent assistance from Sam Von Elk. Sarah and Gray had little to offer Asad or Newton and after 10 overs Newton was 3-1 and Asad 11-0 and just one Bye to give a score of 15. Manish and Mamun were now bowling. A Bye and a single took the score to 17 and there it stuck as Mamun had three consecutive Maidens and Manish had a Wicket Maiden and Maiden to make it 17-2 after 16. That wicket was that of Gray who fell to a fine slip catch from Mendis. Peak had replaced Gray and failed to score falling to Manish bowling after 13 balls. 20-3 after 17. Yousuf and Matthew now had a spell of bowling and the score was merely 32 at drinks. On resumption a no ball was given for the offence of wicketkeeper Niroshan collecting the ball before wicket. Scott had been with pads in the first session. Sarah suddenly had a burst of scoring and was the first player to score on four consecutive balls but in Sams first over and her first strike she sent a ball to backward square leg and Yousuf scooped a low catch. Her partnership with Martin had been a heady 27 and she was gone for 11. 44-4 in 27. McLean replaced and together with Martin finally added a few runs and this late in the match finally had three boundaries in a rapid 15 before Mendis was again taking a slip catch off Sam. Piper replaced and Mamun came back for another spell but was bruised by Martin having two consecutive boundaries before Martin was most decidedly LBW off Sam but a high scorer at 32 and 81-6. Sharma replaced and had the audacity to have a boundary first ball but only odd singles thereafter. Piper fell LBW to Manish just after they finally reached three figures. The second 50 was in 24 minutes after a first taking 81 minutes and Sharma was soon gone, caught and bowled by Manish. This was now 6-4 for Manish. John Twinn was now in and was determined to maximise every opportunity although at this point there were some very eventful dot balls including Mendis effectively fielding by a ball to the helmet but a check revealed ok. John did his best to damage the figures but at the last Sam went for LBW after a boundary and a score of 5 and Manish had 16-5 off his 8. Carey only ever got to face a bye and the innings closed at 135-9 with John Twinn scoring 27 in rapid pace. Tea was a delightful affair in generous proportions catering amply knowing we had supporters including Phil, Augusto, Anthony, Stuart, Tom and James, Pauline, Hugh and a couple of friends and prospective future player Irfan. The lady had thoughtfully provided fully vegetarian to make it as accessible as possible. On resumption, it was our wicketkeepers to face the opening salvos. Niroshan took a single in the first off Harris leaving him to face John Twinn and bowled swiftly just for that single. Mendis was slow to start but after a couple of boundaries he was LBW off Harris at the end of the 5th then on the first ball of the 6th it was Scott to fall LBW off Twinn at 6. That went on to be a wicket Maiden although both Sarah and I both agreed that was a short over and not for the first time, scorers being infallible if misguided as you know. 16 – 3 off 6 was better than their scoring rate but we could have a real challenge if we let wickets go. Mahender and Newton now faced Gray and Sharma with Mahender taking the bat to ball although there were a couple of slip ups as he regained his crease but all too soon his rapid 17 was called time as Sharma bowled. At 38-4 in 13, with Newton only amassing 4 in 7 overs there had to be a gear change and Manish entered the fray. Making up for his Duck last week, he piled runs up quickly as then did Newton and at drinks the 50 partnership was in sight. The bowling was varied including bringing in Van Elk and Carey but our heroes could not be penetrated. Although throughout this match there were few bowling extras, there were a few boundaries now off Byes as well as 10 scored boundaries from the pair of Newton and Manish with a final boundary to Newton in the 31st over that passed the limit and technically raised a 100 partnership from 38 to 138 – 4 when needing 136 to win. Newton was on 48 and Manish 41 not out. Our hosts graciously accepted this defeat by 6 wickets and are already looking forward to future matches as well as floating an idea for a future tour prospect. As so often, Mahender had to consider our Man of the Match and Sam and Newton were easily in the frame but the bowling and batting combination saw it popularly given for the second time to Manish. So four wins now and we are off to Winchmore Hill for two weeks to play Judd St. Tigers and then St. Albans. Can our run hold? I wish you well as will be in Europe and am already in East Devon. As ever please ensure Mahender has up to three weeks availability so that he can rotate when he needs to.